I flew north and south over your country enroute to Dubai during much of 2008 and 2009 while working for Air Astana in Almaty and Astana, Kazakhstan. I had retired from Northwest Airlines in March of 2007 after my reporting of the BUAP and ATI caused the United States Department of Justice to feel threatened regarding the true nature of the flying events of 9/11. When MH370 occurred I was summonsed to Kuala Lumpur to explain to elements of the Malaysian government and to Malaysian Airlines System experts how their aircraft was remotely captured and by whom. Further, I told them if they did not expose BUAP and ATI to the global media they should expect a “second explosive event no later than 1900 hours, local, on 17 July, 2014. That event was MH17. It occurred at 17:21, 17 July, 2014 near Donetsk, Ukraine. 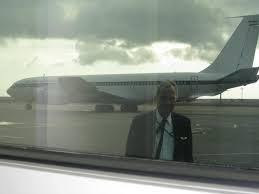 Regarding my relationship with Iran, the most widely distributed image of my on the internet since April of 2009 is the larger, clearer image of me standing at Astana, Kazakhstan with Iranian Air Force 1 in the background. The photo was taken on in April 2009 while the President of Iran and RF President Vladimir Putin were attending a conference in Astana, Kazakhstan and in the same hotel as myself. Under the authority demanded of me on page 9.1.1. of the Flight Operations Manual, specifically bullet statement 4 “The Captain WILL make the FINAL decision as to whether the aircraft may be safely operated.” I deem it impossible to comply with the requirement of 9.1.1. until any captain can know, without a doubt, that QRS-11 is not embedded on his particular jet. As you can determine from the letters below many in the international community were offended when a group of delegates walked out on the President of Iran whilst he was speaking the Truth regarding the events of 9/11. I wish to be put in touch with Mr. President so as to remind him of my offer to him in April, 2009, when he visited Astana, Kazakhstan during my tenure there as a pilot for Kazakhstan’s national airline, Air Astana. While he was still in Astana I communicated an offer to deliver to him the detailed Truth of the flying events of 9/11 if he would arrange to have Fargo, North Dakota Journalist Roxana Saberi released from detainment in Iran. She was released on my father’s birthday, 11 May, 2009. Roxana Saberi (Persian: رکسانا صابری) (born April 26, 1977) is an American journalist who was arrested in Iran in January 2009. On April 8, 2009, the Iranian government charged Saberi with espionage, which she denied. She was subsequently sentenced to an eight-year prison term. An appeals court reduced the charge against her from espionage to possessing classified information, a charge which she also denied, and reduced her eight-year prison term to a two-year suspended sentence. She was released on May 11, 2009. In the middle of the Chapter below you will find a photo I took of Iran’s Air Force One parked in front of Astana, Kazakhstan’s Terminal in April, 2009. I would now like to uphold my end of the bargain. If the President’s staff wishes to contact me they can do so 24/7. I would suggest that they first google my name, sample the website www.abeldanger.blogspot.com and the DVD “Captain Sherlock Solves 9/11“. The DVD movie has been playing often in UK and Western Europe beginning in May, 2011. Regarding Mr. President’s accurate statement regarding “some segments of the US government orchestrated the attacks” let me fill in the blank left by Mr. President perhaps due to diplomatic courtesy: United States Senior Executive Service. Your office may be surprised to learn that US SES was created by my sibling, Ms. Kristine Marcy ( in 1979). Those benefiting from the actions of US SES include City of London Banks, France and Canada. The US airspace was ‘laid bare’ by Canadian Forces Gen Maurice Baril and Charles Bouchard who commanded Northern Commands NORAD in Colorado and 1st Air Force assets (including all ANG air defense detachments) at Tyndall AFB, Florida on the morning of 9/11. They, the Canadians, had practiced the attack once during Operation AMALGAM VIRGO 01 on 1 and 2 June, 2001 and my Annapolis Classmate Captain Chic Burlingame died when his American 77 was downed by technology not deployed by Muslims on 9/11.. I would also like to hear from an officer of ILGHRC regarding the deliberate release of both HIV and HEP-C against targeted sub-populations in eastern US and South Africa. The terror delivered to America on 9/11 and to gays and South Africans trace back to the same evil cabal. We can lead you to the center of the cabal. Finally, the nations of Russia, Malaysia, France and United Arab Emirates have all officially acknowledged my exposure of the BUAP and ATI, if Iran wishes for me to visit an Embassy anywhere in the world I would be able to comply with 24 hours notice. My preference on where to meet would include Tehran, London or Washington DC in that order.